Is NYS Vendor ID same as a NYS Tax ID Number? 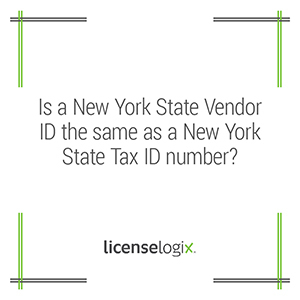 A NYS Tax ID is different from a NY Vendor ID. All New York State Vendors must be registered and assigned a New York State Vendor ID. To establish a NYS Vendor ID, a State Business Unit must initiate the vendor registration process when they want to do business with an entity that is not a registered New York State vendor. The State Business will contact the vendor to collect the information necessary to enroll the vendor in the New York Stat Vendor File. All New York state businesses that sell taxable tangible personal property or taxable services must register with the Tax Department to obtain a NYS Tax ID. If you need a NYS Tax ID, we can prepare and file the NYS Tax ID application for you.